We went nuts over the Brussels sprouts served at Lulu’s. This is a stovetop variation that is a little more intense. Serves four as a side dish. Trim off the outer leaves of the Brussels sprouts. 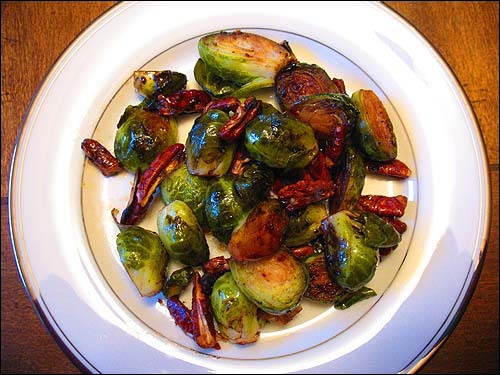 In a heavy pan (cast iron works very well), sauté the sprouts on medium-high heat in olive oil until they start to brown. Add the balsamic vinegar, turn the heat to low and cover. After a couple of minutes, add ¼ cup of water. Cook until the sprouts start to soften, ~ 8-10 minutes. They should brown but not burn. Turn the heat back up to high, add the butter and the pecans. Saute for a minute or so, until the pecans are lightly toasted. Click here to print this recipe as a PDF. This recipe is so good that I made Brussels Sprouts aux Stupides twice this week. I used butter substitute and it was still delicious. After looking at the photo this time, I realize that I should have cut the Brussels Sprouts in half and will certainly do so in the future. Thank you for such an easy but great recipe.